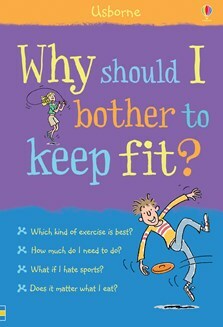 An informative book about how to maintain a healthy body through regular exercise and healthy eating. Answers questions such as: “What counts as exercise?”, “What if I hate sport?”, and “How can I get stronger?”. Includes simple tips on healthy eating, games to play indoors when it’s raining and how to warm up and cool down properly. The importance of physical activity and diet for a healthy lifestyle is now part of the UK National Curriculum for Personal, Social and Health Education (PSHE). This book goes a long way towards explaining the importance of movement. It is clear, factual and full of bright illustrations that youngsters will like.